Life can be thought of in terms of three principles. There is the physical universe that we inhabit. There is the realm of the mind in which we think (it's also the seat of our emotions). And there is the hard-to-define spiritual aspect of life. If you want to contact me, mail me at spj@scilla.org.uk - I will do my best to get a reply to you. 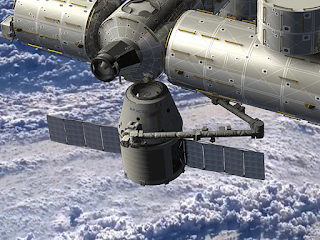 SpaceX plans to send its Dragon spacecraft to dock with the space station, perhaps as soon as Monday 7th May. If successful this will be a major step forward for the comapny. I've been following the development of SpaceX's launcher and spacecraft hardware with great interest. On Monday 7th May, unless there's a further schedule change, the privately owned company will make its first attempt to fly a Dragon spacecraft to dock at the International Space Station (ISS). The launcher - Falcon 9 has flown only twice so far, both launches were successful. On its first flight the rocket carried a dummy Dragon to orbit. On the second flight a fully functioning Dragon was orbited and made a successful splashdown and recovery off the Californian coast. Two successes out of two attempts is a great performance, but tells us almost nothing about levels of reliability. A third success would boost confidence, a failure would be a serious setback. Falcon 9 (and the smaller Falcon 1) both have commercial orders booked for the satellite launch business. In the case of Falcon 9 those bookings alrready represent a considerable part of the worldwide launch business. If the launcher continues to fly successfully it will quickly become proven as flight frequency ratchets up. At least four further launches are planned in 2012, both for freight delivery to ISS and for commercial customers. The spacecraft - Dragon has flown once before, this time it needs to repeat the success, navigate to the ISS, and automatically fly to within a few metres of the station. If it manages this, the station's remote manipulator arm will dock it to one of the modules and the ISS astronauts will open it, unload the cargo, and load Dragon with experimental material for return to Earth. Finally, SpaceX will fly the craft back to splashdown in the Pacific and the capsule and its cargo will be recovered. A difficult mission - We shouldn't underestimate the difficulties faced by SpaceX. The mission is complex and much of it goes further than the company has ever gone before. It will not be suprising if the mission fails in some or all of its objectives. Nevertheless I think the chances of success are quite good, and I wish SpaceX well with the mission. What next? - If the flight is a success, NASA has a contract with SpaceX for further cargo flights to the ISS. This would involve two or more flights annually for several years. As mentioned above, there are also contracts with other companies and organisations to fly a variety of other spacecraft. Furthermore, SpaceX is offering commercial Dragon flights (DragonLab) for science and technology payloads for return to Earth. Expect to see a new version of Dragon for crewed NASA flights to the ISS (or indeed for other organisations). SpaceX is already well along in developing the necessary hardware for this. And there is a much larger launcher in the pipeline too, Falcon Heavy. This is scheduled for its first test flight later this year, though it may slip to 2013. For more on SpaceX and their plans see their Google+ page. What is the greatest priority? An article by Sam Hailes in Christian.co.uk started me thinking about this. Sam interviewed Peter Farmer from Nottingham, Tony Goddard from Peterborough, and Beresford Job from Chigwell. These three men have different ideas on the main priority - mission and multiplication (Peter), making an impact and caring (Tony), following Biblical principles (Beresford). If we cast the net wider we will find many more groups with other insights and emphases. Every denomination and group has its own ideas about what is most important. To answer this question we need to turn to the Bible. But where should we look? I suggest that the most important and fundamental guidance will come from carefully hearing what Jesus said. In particular, his prayer just before his arrest must be the best of all sources for what is essential. Think about it for a moment. Yahshua knows that his whole life has brought him to this place of sacrifice. The burden upon him is enormous, his heart is heavy and he cries out to the Father. Surely what he asks at this moment will be the most important thing of all. What does he say? In John 17, Yahshua prays for his disciples, and there is much here that we can benefit from. But then he prays explicitly for you and me. And this is what he asks. My prayer is not for [my disciples] alone. I pray also for those who will believe in me through their message, that all of them may be one, Father, just as you are in me and I am in you. May they also be in us so that the world may believe that you have sent me. I have given them the glory that you gave me, that they may be one as we are one – I in them and you in me – so that they may be brought to complete unity. Then the world will know that you sent me and have loved them even as you have loved me. He wants us to be one, united, not split apart. The Messiah himself prays to the Father that we may be one 'just as you are in me and I am in you'. He wants us all to be 'in us' (the Father and the Son) so that the world may believe the Father has sent the Son. More than that, Jesus has given us (you and me) the glory that the Father gave him. What?! Read that again. He's given you and me his glory! Why? So that we may be one. Then the world will know. And he prays that we may be where he is and see his glory. There's just no escaping this fundamental truth, that when the chips are down Jesus prays his heart out to his Father and asks that we may be one so that the world may believe. What is the most striking thing about the church in our day? It is divided into myriad groups and denominations, all pointing to different things as being the most important. 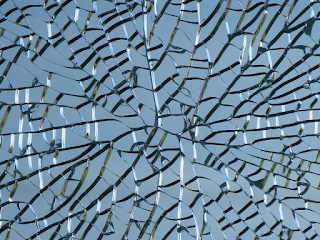 We are a broken, shattered people and the heart of Christ is broken when he sees us in this state. His heart is for us to be one just as he and the Father are one. And he wants to include us in their oneness and community. Peter Farmer is not wrong about mutiplication and mission. Tony Goddard is not wrong about making an impact and caring for people. And Beresford Job is not wrong about following Biblical principles. But above all, we now need to learn to be one. We need to celebrate our differences and learn from one another. There is no single right belief, right speech, or right action. His children all shine with the light of his presence. If we are to be part of the answer to his prayer we need to learn from one another and grow together in love, building one another up, encouraging one another, helping one another to focus on every good thing. We need to grow up into Christ. Paul understood this well, see what he wrote to the Ephesian church. As a prisoner for the Lord, then, I urge you to live a life worthy of the calling you have received. Be completely humble and gentle; be patient, bearing with one another in love. Make every effort to keep the unity of the Spirit through the bond of peace. Christ himself gave the apostles, the prophets, the evangelists, the pastors and teachers, to equip his people for works of service, so that the body of Christ may be built up until we all reach unity in the faith and in the knowledge of the Son of God and become mature, attaining to the whole measure of the fullness of Christ. I am not suggesting that anyone is wrong, or that some are more right than others. 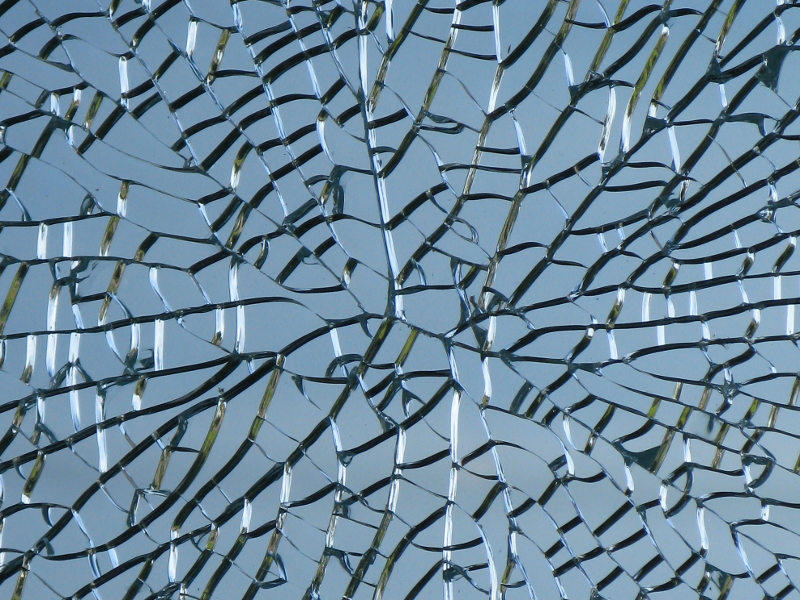 I am simply observing that we remain shattered and that we are not yet perfectly formed into the one bride for whom Christ died and will return. Let us all strive to forge fresh bonds of peace. Paul called the Ephesians to keep the unity of the Spirit. Today we need to do more than that, we need to regain the unity of the Spirit. Jools Holland relates the history and symbolism of Rochester Cathedral. It is an amazing place, and like all cathedrals it is designed to remind us of who we are and what we have in Christ. We spent the weekend at Rochester in the county of Kent, the south-eastern corner of England. The historic old town with its imposing castle and beautiful cathedral is today part of a large conurbation including the dockyards and industries of Chatham. But Rochester still retains much of its ancient character with lovely old shops lining a long, straight High Street - part of the Roman road called Watling Street. 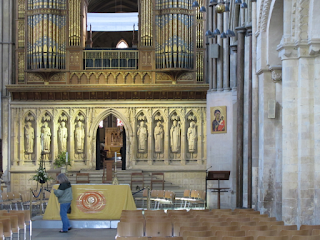 We visited the cathedral on Saturday and I enjoyed a recorded commentary narrated by Jools Holland. There are several commentaries available including the reflective one that Donna chose. But I picked the historical guide and it was indeed fascinating. I'd like to share some of the things I learned, and reflect on them because they still speak about our individual spiritual journeys. The entire building is full of mediaeval symbolism. The ground plan of the cathedral is a cross, and this immediately reminds us of Christ crucified. But there is so much more. And this ancient symbolism is just as appropriate to life today as it was when the cathedral was built. At the western end of the building is the main entrance, situated at the end of the long arm of the cross. Looking out from the great doorway we see the part of the horizon where the sun sets at the end of each day. So to enter the building it's necessary to turn away from the setting sun, leaving the dying world behind. This is lost on modern visitors, but it would have been very clear to people in mediaeval times. Without electric lighting, evening would be a time of darkness. It was a time when work could no longer be done, truly an ending of the day. Turning our backs on the place where daily life ends we climb the steps to a higher level and enter the Almighty's house. Once inside we are awestruck by the space and openness and beauty. This is a picture of turning our backs on the world and coming into the presence of the Most High. We are now facing east, looking towards the place where the sun rises and the new day begins. 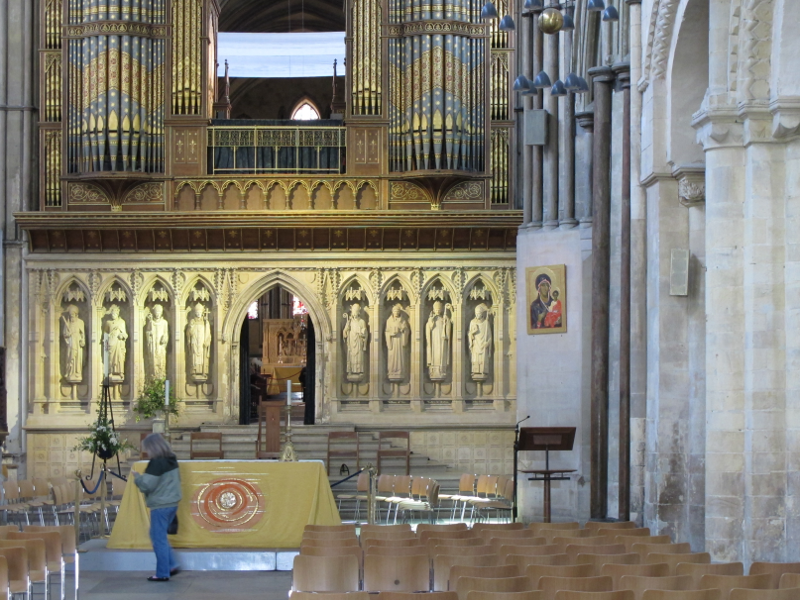 Far ahead of us and at a higher level is the high altar, representing the Presence. Having rejected the world and entered this special place we are at the beginning of a journey forwards and upwards towards the Almighty, towards the new day, and towards the place of new and eternal life. After walking the length of the nave we come to the place where the north-south and east-west arms of the cross meet. This place represents Christ. It is the place where the bread and wine are received in communion. A rood screen blocks further movement towards the high altar, only the priests and the monks of the choir would have been allowed beyond. For ordinary people it was sufficient to come into the presence of Jesus. The photo shows the carved, stone screen with the organ pipes above it. And beyond the screen, up futher steps, is the high altar (visible in the photo through the arch in the screen). A lamp hangs from high above, a red light burning in it continuously. This lamp was given to Rochester by the Orthodox church in Jerusalem. It represents the Almighty's presence hovering here. And at the back is a small white light, also continuously burning but not immediately seen by many. This symbolises Christ, a source of light patiently waiting for us to notice him. We don't need the symbolism of course, but we do need the truth to which it refers. In mediaeval times the symbolism would have been very powerful and would have spoken equally to rich and poor, literate and illiterate, powerful and weak. When it is explained it still speaks to us in the same way. Turn your backs on a dying world and enter in to my presence. See my power and majesty and glory. Approach me, trusting and sharing in Jesus Christ my Son. Come to the place where he is, trusting in the effectiveness of his death and new life. Share in his body and blood, given for you. And recognise there's a place you can't yet go, where a new day will dawn. The place where the Father and the Son together will rule for all eternity, their light will never go out. You may not notice me at first, but I am here. I am waiting for you. Come and find my light in your life, seek me out. Here are some of the main points made by Tony and Felicity Dale during their recent interview by Nomad. It's all good stuff; Tim and Dave head home with some highlights still buzzing in their minds. Tim and Dave run the Nomad Podcast. If you haven't heard any of their monthly interviews, you've been missing a treat! 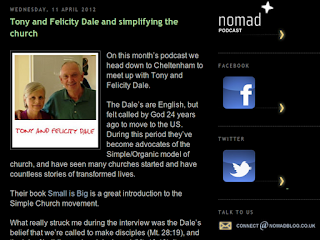 The latest interview is with Tony and Felicity Dale from Texas, recorded when they were in the UK recently. Tim and Dave travelled to Cheltenham to meet them for the interview. After five minutes of mirth and banter in the car they finally get to the point and the interview begins. We hear the background story of the Dale's early days in medical school with patients coming to the Lord and many small, home-based communities. They moved to the USA in 1987, clearly led by the Spirit, but once they arrived they were at a loss for direction. After nine years they gave Father an ultimatum, and things began to move again. They led a discussion with businessmen based on Proverbs and over the next year all of them became believers. They also started a breakfast Bible club for their children's friends. The children and then their families began to follow Jesus too. With the business people and the new families they decided to try to multiply the small rather than just growing bigger. They learned that success in Father's eyes is not about what we do but much more about what we become because of Jesus. Even before they left the UK they learned not to build something that can survive with or without the Lord. But simple church is not a panacea for all ills, preconceived ideas can mean that house church just becomes big church shrunk smaller. Felicity describes a simple church in an underprivileged area. It was messy and based very much on present needs, but that is what Jesus loves to do amongst his people. Life brings us into church as a lifestyle, not an event. We need to understand that we don't need experts, anyone can start a church. People gather in every context, the person of peace may be a Cornelius or a woman at the well. But regardless of the kind of person, such people have circles of influence and they have the ability to lead built into them. Simplicity implies reproducibility, complexity slows down multiplication. We need to find simple patterns that the Lord can work through. Simple food is better than complex food, for example. Pot luck or pizza is just fine. The same applies for prayer for one another. Tony explains that they determined never to make things complicated or difficult. Prayer is just chatting naturally with Father. The person of peace concept is missional, moving out into that person's context. Sequentialism is a barrier to multiplication - 'I need to do this before I start to do that'. Local community worked in the East End of London, but it doesn't work for the Dales in Austin. However, people are very mobile in the USA and they have community with visitors, at work, at the gym, or Starbucks. They are therefore living the presence of the Lord wherever they can. We are called to make disciples, Jesus will build the church with those disciples any way he wishes. Tony explains how this happens in the business he runs, it's not a Christian company but discipling takes place there very naturally and easily. Disciples need to learn the key skills of hearing from the Holy Spirit for themselves and being obedient. After the interview, Tim and Dave discuss the session. Tim is particularly struck by the idea that making disciples is our call and Jesus will build the church. Dave is engaged by the thought that disciples are primarily people who hear and obey the Lord. There is some more amusing banter before the recording ends. See also: Felicity's blog 'Simply Church' and the 'House2House' organisation they set up. The Seven Signs in John are a perfect basis for drawing people into relationship with Jesus. But they are also well worth the attention of those who already know him and walk with him every day. They are eye opening and mind expanding. The Seven Signs in John are a great way to investigate Jesus with people who don't yet follow him. When someone is interested enough to want to know more, rather than 'teach' them about Jesus it may be better to help them discover Jesus for themselves by reading and unwrapping the seven signs. 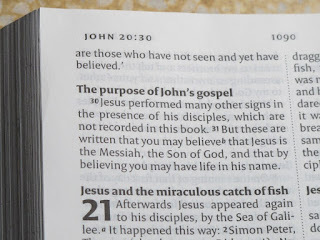 Briefly, in John 20:30-31, John explains that of the many signs Jesus performed, he has chosen to write down just seven 'so that you may believe'. 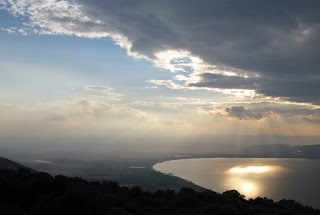 The first two signs take place in the village of Cana in Galilee where Jesus turns water into wine (John 2:1-12), and later heals the son of a royal official (John 4:46-54). The other signs are listed by Neil Cole on the CMA Resources website. I encourage everyone to read that article and also listen to Neil speaking about the seven signs. Clearly, these signs are written for unbelievers so that they can come to faith in Jesus and receive new life. 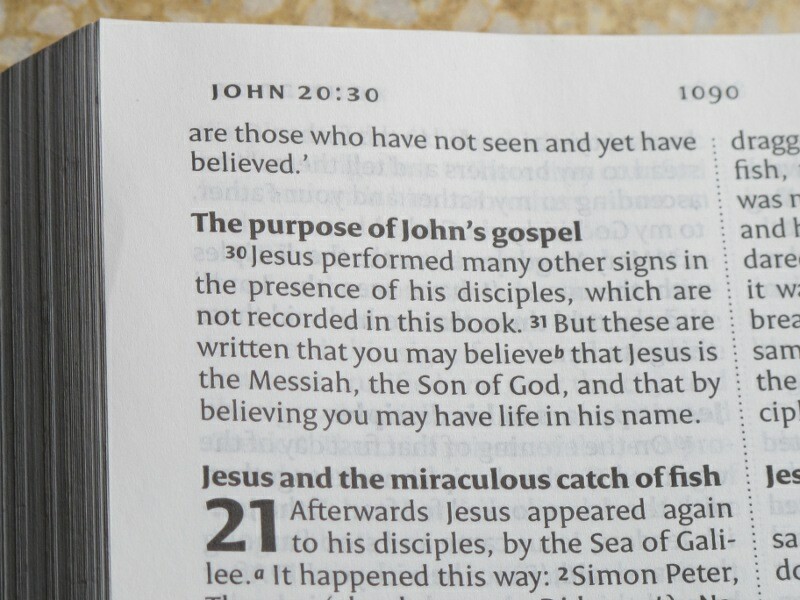 But can these passages from the book of John be of value to those who already believe? Yes, they can. Discussing the first two signs with a group of friends who are already fully involved in church life has been an interesting experience for me. As we discussed the passages I noticed a growing awareness of the power and depth of John's words. The four questions suggested by Neil brought this out very clearly for my friends. They quickly understood the value of using the passages to see that people are just the same today as they were 2000 years ago and that Jesus is approachable and able to help ordinary men and women. They could also see how the passages demand a response and recognized that others need to hear these accounts of the signs for themselves. Based on this experience I would say that believers benefit from the seven signs in a variety of ways. Recognising that the people in the Bible are 'just like us'. The Bible thus becomes more immediately relevant; it's no longer a book of merely historical and spiritual significance, but a book in which the Father and the Son deal with ordinary people in very practical ways. Seeing Christ himself in the pages of the Bible. Jesus, as described by John, is deeply relevant to us and to the people around us. Understanding the need to get people thinking for themselves. The best approach involves reading the verses together and asking questions. Viewing outreach as something we can all do. The seven signs are a very easy way to get started, either one to one or with a small group of interested people. There is one caveat, however. There is a real danger that people who already follow Jesus may see the signs as a handy teaching technique. This misses the point. The whole idea is to encourage everyone to think for themselves. We don't need to teach people about Jesus, they will draw their own conclusions if we encourage them to read the passages and ask the right questions. This fundamental shift in approach is something that may not come easily. But one way is to look at the way Jesus interacted with the people he met. And one way to do that is to try the seven signs for yourself, preferably as a group but if necessary on your own. 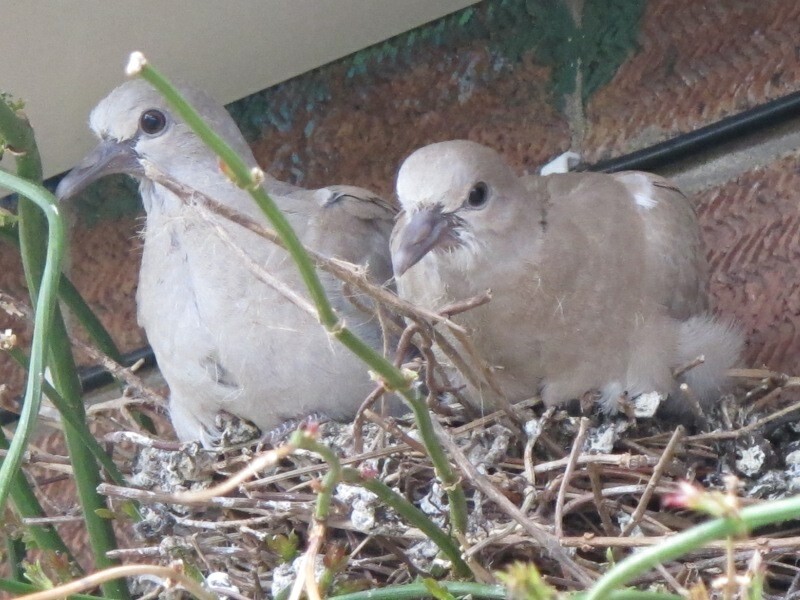 These young collared doves have been amusing us for a week or so. The parents built a nest in a jasmine plant just under the eaves of our house and we've watched as the chicks have grown. Now they look much like the adults and will leave the nest very soon. Defining joy is not easy, but it's well worth a try. It is an internal thing, yet it can have great external effects in the lives of those who have it. One of the things I remember about church from my childhood days is that it seemed dull. Church was a chore. We had to get dressed in our best clothes, we had to be quiet, we couldn't read a book or play with toys, we had to stand up and sit down at the relevant times and say words we didn't really understand when everyone else said them. Oh, and we had to listen to a man in strange clothes talk about things that didn't engage us and that we'd soon forget. Church even smelled boring! The combination of ancient, polished timber, the cool humidity of the massive stonework even in the hot summer sunshine, and the leathery, musty paper of well-worn hymnbooks spelled dullness. I was always glad to get home and change into ordinary clothes. Then I could read books, ride my trike in the garden, or play with toys on the sitting room floor. And later, as a young adult with children of my own, church was still relatively sombre and heavy. It was a serious matter and laughter was out of place except, perhaps, over a cup of tea after the service. Where was the joy? What is joy anyway? What good is it and why do I need it? Joy is listed by Paul as part of the fruit of the Spirit (Galatians 5:22-23) yet it's not something we often study. We know the importance of love and peace, of patience, kindness and the rest. But joy? It seems to be an inner thing, not affecting those around us. It's like an inner smile, a peaceful sense that all is well, a deep gratitude that Jesus has saved us. But where is the fizz, the bounce, the excitement, the celebration? In his autobiographical book 'Surprised by Joy', CS Lewis describes joy as an intense longing for something good. And described in those terms, surely joy is not only an inner smile, but also a sturdy force driving us to touch the hearts of others so they, too, may find joy in their inner being. Here's an extract from his preface. Joy is a tricky word to define. In some ways it suggests the opposite of dull and boring. 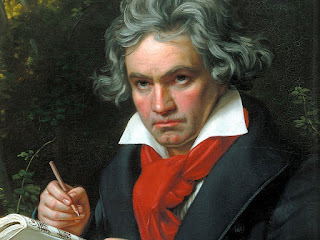 The word also conveys a sort of inner energy, a hopefulness, and a patience in difficult circumstances. Yet it means more than that. My friend Jenny, writing about anxiety in the Stamford Free Church newsletter for April 2012, puts it like this. Lately I have been thinking about what we mean by worry and how we use that word when we mean all kinds of different emotions and feelings. Very often, when we say that we are worried about people, especially family members, what we mean is that we feel compassionate and have empathy with their problems and difficulties ... those sort of feelings are quite legitimate and show that we care. Jesus told his disciples many times not to worry or be afraid and that he would give them peace, so let's give all the personal 'worries' to him, let's try to make prayer our first response instead of our last and as for the other things that the media would like us to take on board - why worry? So perhaps it's fair to say that joy is also an absence of anxiety. On the face of it, joy is a personal and private inner thing, a component of the fruit of the Spirit that is not visible externally (like the stone inside a peach). Yet it has great power, just like the stone that contains a seed capable of generating a whole new peach tree. So joy, although it is internal, has the power to achieve much. Perhaps it's easier to say what it is not rather than what it is. Joy is not dull or boring, it does not leave room in my heart for worry or anxiety to take root, and it strengthens me for greater endurance in love, peace, patience, kindness and the rest. Only love comes ahead of joy in Paul's list in Galatians. And for good reason. Without love and joy the other aspects of the fruit might not even be possible. Along with peace these two are internal parts of the fruit. The other six are the active outward expression of the love, joy and peace within. This article is part of a chain blog on 'Spiritual fruit'. If you want to write the next article in the chain please check the chain index for details.